Social networks have become important in our everyday lives, with an estimated 2.77 billion users total worldwide. They are so important that, to date, Google has attempted success with 8 social networks, ultimately shuttering 5 of them (most notably Orkut and Google+). However, Google still has an active social network! And this network is different, because Google has taken an already successful service and slowly added social-like features to it. Yes, I think the time has come to finally call Google My Business a social network. Ask and reply to each other’s questions. Access limited-time posts and special offers from the business. “Follow” businesses to receive notifications. And if a user interacts on the service frequently, they can even get badges and additional perks like special event invites. At the end of the survey, you wouldn’t hesitate to identify Google My Business as a business-focused social network. Check your listing frequently and respond to questions, reviews, etc. Create content tailored to GMB users. Post content (images, posts, offers) regularly, because posts expire after 7 days. Keep up-to-date with Google’s new features. 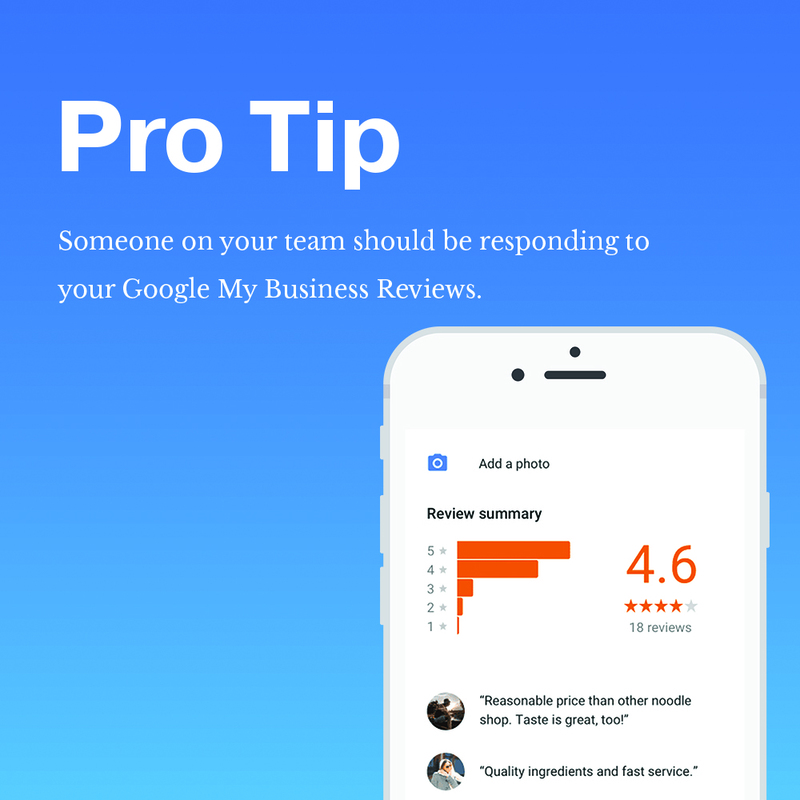 PRO TIP: Someone on your team should be responding to your Google My Business Reviews. Is Google My Business the Most Important Social Network for Businesses? I know what you’re thinking: “Ugh! Another social network to maintain?” As a small business owner, I completely understand! Maintaining so many social networks (and posting content tailored to each network, engaging with users, providing customers service, etc.) can run you ragged. However, GMB might be one of the most important social networks for your business. Why? The answer is in your marketing funnel. Let’s talk about the difference between social media and search engine marketing. Social media is traditionally a “top of the sales funnel” marketing activity, where you engage with users and make them aware of your product or service. Often times, creating awareness and convincing users that they need your services takes a fair amount of time and money. Search engine marketing and search engine optimization are traditionally seen as “bottom of the sales funnel” marketing activities, where users are closer to making a purchase. Users at this end of the funnel don’t have to be convinced that they need your services. They’re already searching for what you offer. This is why GMB is such an important social network for businesses, because people who have found your listing (most likely local customers) are already looking to buy what you are selling. Make the smart choice and invest in your GMB page! 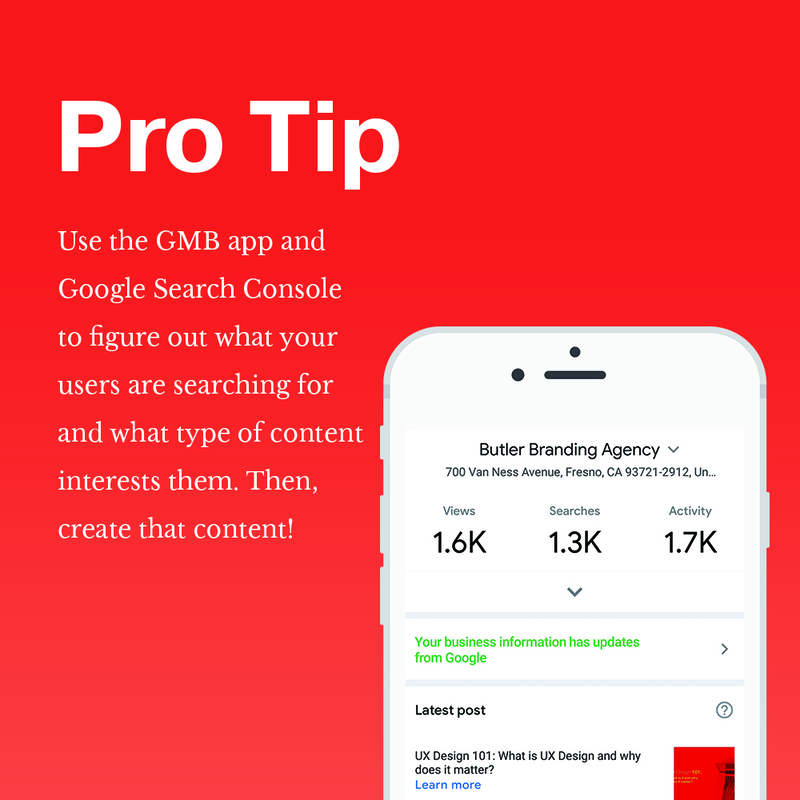 PRO TIP: Use the GMB app and Google Search Console to figure out what your users are searching for and what type of content interests them. Then, create that content! This post comes from guest author and fellow digital marketing guru Matt Cilderman, Owner of Cilderman Solutions. If you want to learn more about how to optimize your Google My Business Listing, or more about Matt Cilderman, be sure to visit the Cilderman Solutions blog. You can also check out Matt’s guide to Blogging for Creative Entrepreneurs over at The Futur.